Gone are the days where online dating was a young person’s game, and now you can find many websites for the young at heart to find likeminded individuals online for friendship, fun, and even love. Seventies Connect offers a pool of over 2 million singles, able to be searched by location and age, all on an easy to search platform where you can chat and browse with ease. Extra features can be used if you are technologically confident, the choice is yours! Seventies Connect manages to be both senior friendly and yet entirely un-patronising to use. From the moment you land on the sign up screen, everything is simple and clear to follow. In five steps you will have an account, and these steps are basic information using drop down menus or text boxes. Make sure you use a valid email address to sign up with, as this is where your messages will get sent when you are not on the website itself. You can also enable mobile notifications and use your mobile phone to date on the move. Once you have completed the sign up process, you will be prompted to build your own profile. This is the first impression that other singles will receive when they find you on the website, so it’s worth your while to take some time to make it an accurate representation of yourself. Include a photo or even a video message, add in as many of your interests as you can, and use the open ended questions to give over your personality and sense of humour. If you aren’t sure about any part of the profile, you can always skip it and come back later. Everything on the website is made to be as intuitive as possible. All areas of the site are accessible from the main home page, in easy to use tabs from the top or bottom of the screen. Take some time to familiarise yourself with what every area does, including updating your profile and the ‘looking for’ section, to receive accurate matches. These can be found in the ‘Encounters’ section of the website, and the more you interact with them, the better the matches you will be sent. If you see someone who takes your interest, get in touch directly via inbox or instant chat, or save their profile to revisit later in the ‘Favourites’ section. For those members who feel more confident online, you can make the website even more of an online community for yourself by taking advantage of some excellent extra features such as the innovative dating diaries. Here, with the help of an inbuilt blogging tool, you can read other peoples dating journeys, or even share your own. This is a great way to get to know people before reaching out. Especially with senior dating, safety can’t be taken too seriously. Many of the members of the website may not be as confident with online dating, or aware of the common problems which people can face in terms of security. 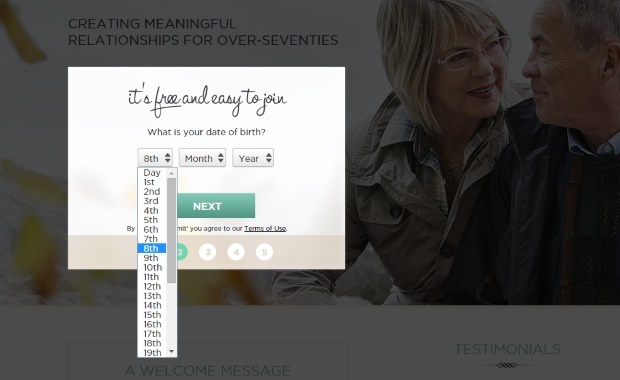 Seventies Connect provides 24/7 monitoring of profiles and behaviour via Online Dating Protector, who can be chatted to live via the help screen or the upgrade page to ask any questions or report any suspicious behaviour. They also provide a comprehensive safety tips page which allows any user to learn how to keep themselves and their identity safe from online phishing schemes or identity theft, and also the best way to protect themselves when moving to a real life meet. We recommend that all users take the time to read this excellent safety resource. If you’re new to online dating, try the 3 day trial for a risk free £4.99. Once you’re ready to commit for longer, you will get the most out of your subscription by committing to a longer term contract. While the most expensive option is £29.95 for one month, it quickly drops to £19.99/month for 3 months, £15.00 per month for six months, and a competitive £12.50 per month if you sign up for a year. Be aware that whichever option you choose, the payment will not be taken in monthly instalments, but rather a one off fee. Seventies Connect is a great resource for older singles looking to online date and find likeminded individuals for friendship and love. Easy navigation and simple search makes this a top contender in mature dating.